Implants are indicated whenever at least one tooth is missing. If the missing space(s) is not filled, the teeth surrounding the space often drift, the opposing teeth will over erupt (hypereruption) which can change your bite, bone erosion can occur , and even changes in speech might occur. The popularity of implants has increased steadily over the years. Implant supported dentures are also an option. New materials and techniques have made retention of implant supported dentures rather than conventional dentures. Please book an appointment to see if Dental Implants are the right option for you. 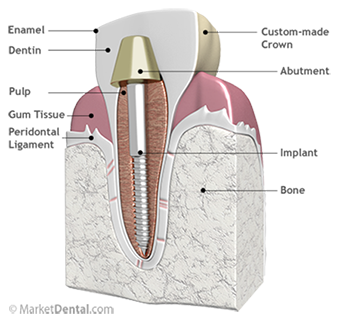 Axis Dental Clinic provides excellent Dental Implant services to our patients.